I get the "what makes your wine industry unique?" question a lot, and Pinotage is right up there with boerewors, Nelson Mandela and World Cup Rugby champions. That's why Argentinian malbec does so well in America, because it is an Argentinian calling card. My American customers know South Africa produces a wide variety of quality wines, but so do many other countries. 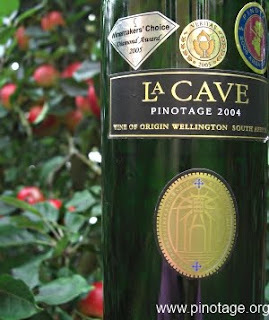 But what makes us unique is Pinotage. I actually start off by offering my customers a chance to taste a good red wine without telling them what it is. After I have identified it for them and told them the Pinotage stories, it's an easy sell. It's not brain surgery, but it works every time. 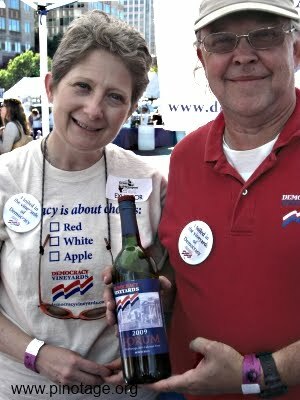 At a wine fair in Renton, Virginia, last week I met Susan Prokop and Jim Turpin (pictured) who own Democracy Vineyards in Lovingston. They started in April 2009 with the aim of having 12 acres of their farm planted to vines. So far they haven’t planted Pinotage but Jim told me they were thinking of doing so in their upper field vineyard. In the meantime, while waiting for their vines to mature, they are buying grapes. 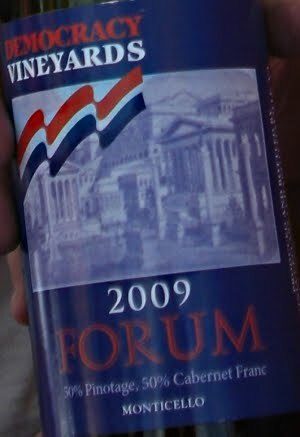 For Democracy Vineyards ‘Forum’ 2009, which is a 50/50 blend of Pinotage and Cabernet Franc, they sourced Pinotage from nearby Lovingston Winery. Riaan Rossouw, who is winemaker at Lovingston, crafted this wine for them. “We wanted to make a lighter styled wine,” said Susan. I found the wine to very easy drinking, being soft and very fruity with ripe cherry tones, and good value at $10. The Cab Franc, which has not seen any oak, makes a good partner. Jim’s background in politics inspired the venture’s name and his large collection of historic campaign material is destined to decorate their tasting room. Grapes for the 2008 Welbedacht Estate Pinotage were hand selected from a 21 year old Bush Vine block growing on decomposed granite soils. “these grapes were specially selected and hand harvested with plenty of hands-on devotion during the vinification process. The Estate boasts some impressively senescent soils and this is prevalent in the intensity and multi-faceted character the 2008 Pinotage. I find it regreshing to see so many new names in the winners list but of course they take the place of some well loved familiar names. Neil Pendock called it Changing the Guards at Pinotage Palace noting that the Pinotage's traditional terroir this time only supplied two of Top 10. Interestingly the Die Laan is made by students studying winemaking at the Stellenbosch University in the small cellar adjoining the house that Abraham Perold lived in while serving as the University's first Professor of Viniculture and Oenology. Does the influx of new names mean that the mystery of making great wines from the challenging Pinotage variety is no secret any more? If so, the Pinotage Association must be congratulated on their work in research and disseminating their findings.